Freshly launched today and simply waiting for your lips, the *Jouer High Pigment Lip Gloss is love at first swatch; featuring intense color payoff, a hydrating and bouncy texture and a gorgeous dose of non-sticky shine, these are a lip gloss lover's dream. I have a plethora of photos to share with you and hope that my travel schedule (which has been wonderful but relentless) will enable me to put the final edits on a serious amount of lip swatches and a comprehensive review soon. 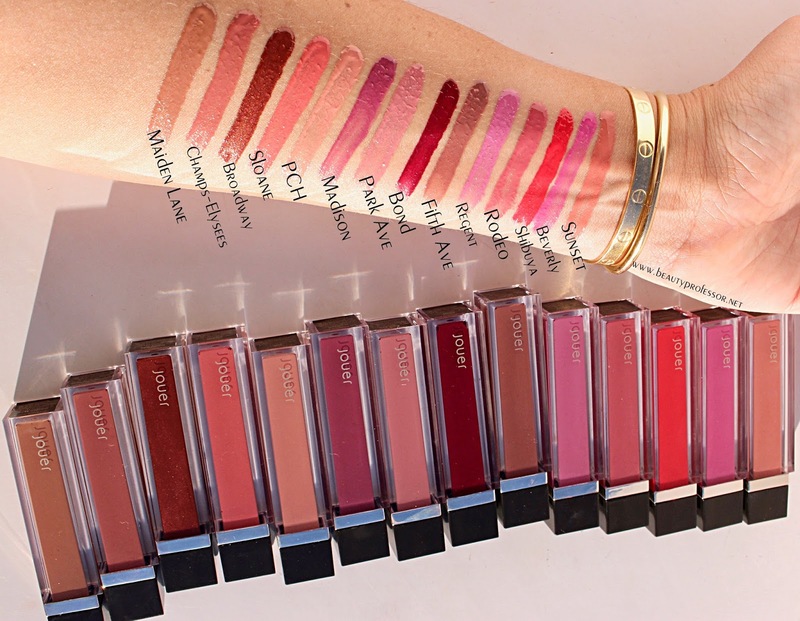 In the meanwhile, to help you choose your optimum match (or, dare I say, matches), here are swatches of all fourteen shades as well as a close up of two of my favorite hues in the lineup! Ingredients: Octyldodecyl Stearoyl Stearate, Diheptyl Succinate, Capryloyl Glycerin/Sebacic Acid Copolymer, Simmondsia Chinensis (Jojoba) Seed Oil, Silica Silylate, Cocos Nucifera (Coconut) Oil, Phenoxyethanol, Caprylyl Glycol, Ethylhexylglycerin, Hexylene Glycol, Silica, Flavor (Aroma), Tocopheryl Acetate. [May Contain (+/-): Mica, Red 30 Lake (Ci 73360), Iron Oxides (CI 77491, CI 77492, CI 77499), Titanium Dioxide (CI 77891), Red 7 Lake (CI 15850), Yellow 5 Lake (CI 19140:1), Red 27 Lake (CI 45410), Red 6 Lake (CI 15850), Red 28 Lake (CI 45410)]. My latest shoe addition (and obsession). 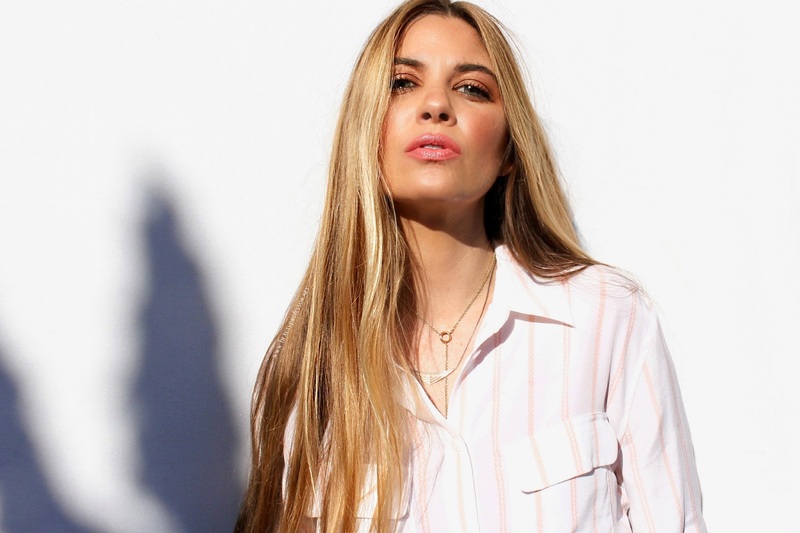 Equipment Signature Striped Silk Shirt: In the quintessential shades of summer (it will set off even the slightest tan) and currently on major sale! Frame Denim Jeans: Loving raw edge jeans for extra intrigue at the ankle. Tori Burch Embroidered Suede Mule: Chic, comfortable and entirely versatile, this shoe is on sale with an extra 35% off. *La Prairie Anti-Aging Foundation #500 (medium coverage, skin benefits and a velvety smooth finish...it's a classic) applied with the *Artis Elite Gold Palm Brush (reviewed HERE) for the most seamless canvas. *Guerlain Terracotta Sun Tonic Bronzer (reviewed HERE) to lightly sculpt and warm up the face. 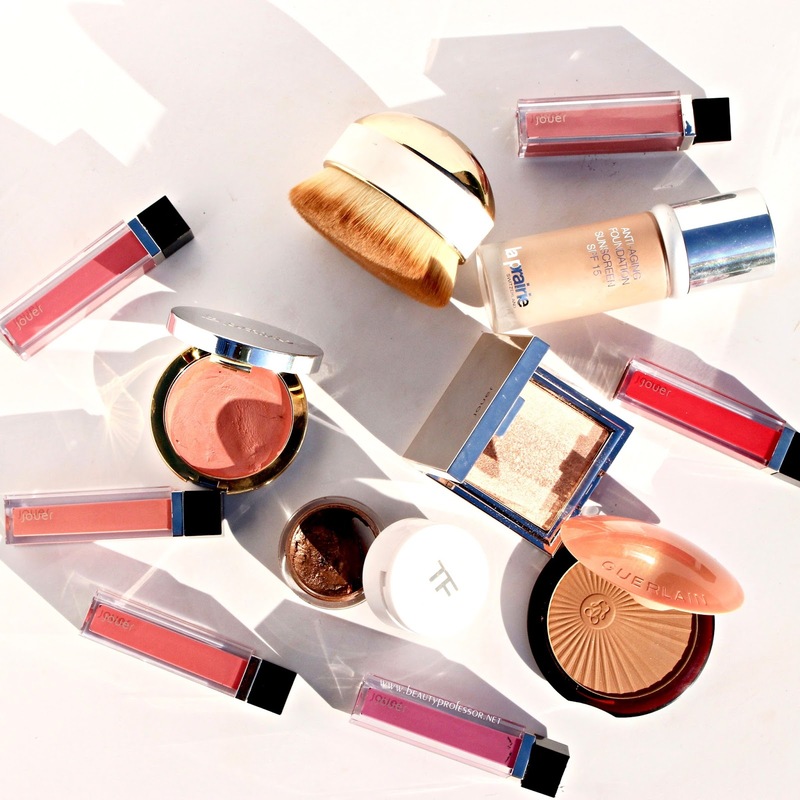 *La Prairie Cellular Radiance Cream Blush in Peach Glow (reviewed HERE) blended with my fingers on the apples of my cheeks. *Jouer Skinny Dip Highlighter (reviewed HERE) applied to the high points of my cheeks, down the bridge of my nose and on my Cupid's bow. 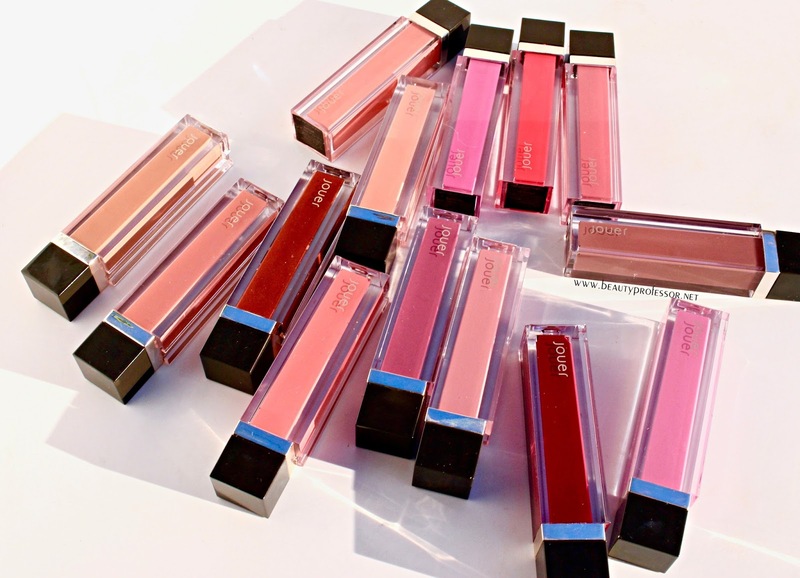 Bottom Line: I truly hope you enjoyed this preview of the *Jouer High Pigment Lip Gloss...which shade is YOUR favorite? Also, for major beauty news regarding launches for Fall and Holiday 2017, make sure to follow me on Instagram as I am currently reporting live from the Neiman Marcus Beauty Conclave! I haven't worn gloss in ages, but I just ordered Champs-Elysees and Broadway. It's my first Jouer purchase. Thanks for the swatches. That's awesome news...I hope you love the formula as I do. 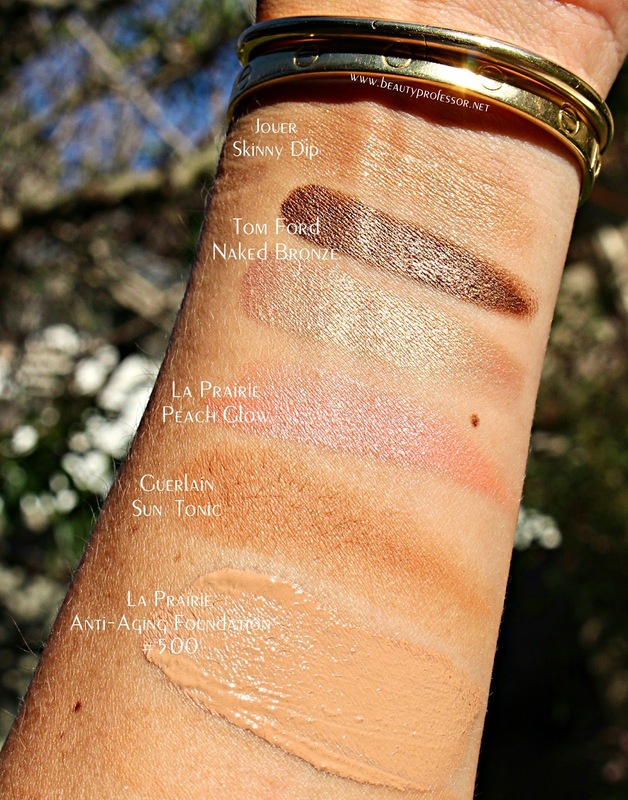 The swatches were my pleasure...let me know what think of the gloss! Rachel, would you mind giving us a tutorial on lips? Lip liner application; do you use a brush for lip color or straight from the tube; glosses! always? And the technique involved--do you over line? or apply lipstick beyond your natural lip? Thank you for the question...I love the idea. I will work on something this month so keep an eye out!